« dear deer, please leave. 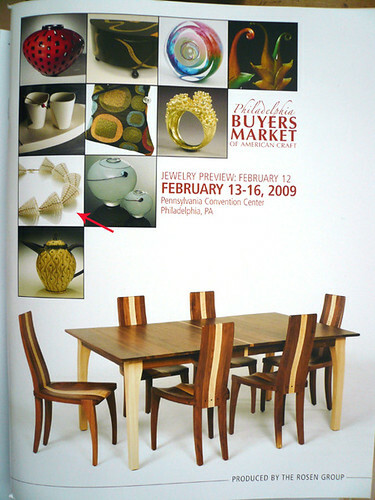 This entry was posted on Thursday, February 19th, 2009 at 1:09 pm	and is filed under jewelry, travel. You can follow any responses to this entry through the RSS 2.0 feed. You can leave a response, or trackback from your own site. Your photo makes you look very chic and almost intimidating. High style look. …but I know the “other” you, which is warm and welcoming. In spite of the low turnout because of globally poor economy, I’d say you did very well—orders from a most impressive place, plus on the cover of the exhibit brochure. And it is most fortunate M brought Jimmy; it would have been very strange to get a call from you in Florida! That is all so wonderful! Congratulations!!!! And perhaps this is the first time I’ve seen your face on the blog! I’m also glad you are not in Florida. You so totally rock. You and the work – both gorgeous! And I love that people *got it* about the beautiful and different element you’re able to create and convey. Of COURSE they chose your work for the cover! Yayyyy! There you are, at buyers market. We all knew this day would come!!! 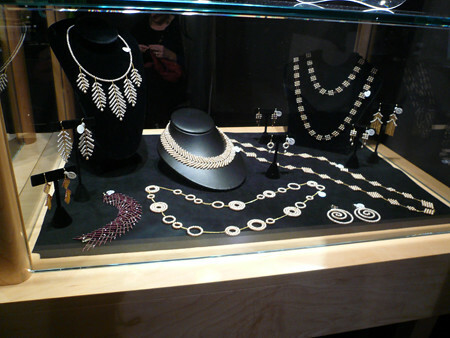 Your work is stunning, and the display lovely. Congratulations. 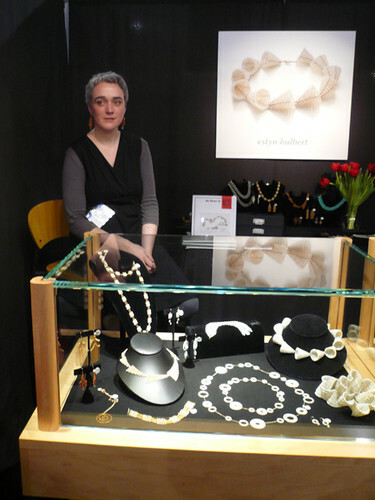 That’s a wonderful image of you in the booth surrounded by your jewellery.It’s great seeing it all together,and presented so stylishly! You’ve worked so hard on your designs so it’s lovely to hear they were well received .Congrats on the orders and being on the cover…wow! That is SO awesome! I am so excited to hear about your well-deserved recognition, and your work looks so lovely. it’s not jimmy! it’s called bohannon. and it’s not a toy either. much. 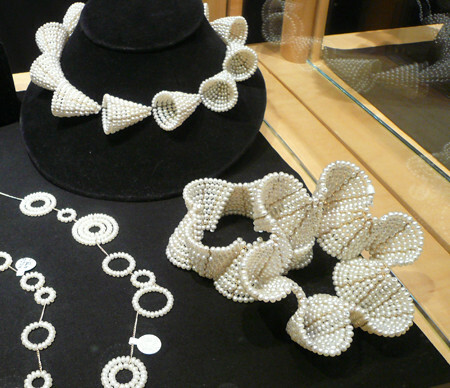 Pearls, Estyn, Pearls, Estyn, Pearls, Estyn everywhere. A Treasure Chest from the Sea. estyn … congratulations on a successful event … it takes courage and stamina to be there and yes … it’s good to hear it all … roll up your sleeves to fill the orders and yes bask in the glory of the cover girl piece!!! big congratulations, such a professional looking display and everything looks beautiful. you deserve the fame and i only wish you the best going forward. i am excited for you! I am so touched by all outpouring of support and affection for you and your work here. Congratulations!! Your work is beautiful, and exquisite, and obsessive and very elegant and fine. I am so glad the world has a chance to see it and recognize it. May this be just the beginning of who knows what kind of adventures your work will take you on!! what a fantastic first experience and what a gorgeous booth you put together! as for jimmy/bohannon, the real question is which voice is it set to?! Congratulations!!!! Your jewellery is absolutely amazing.